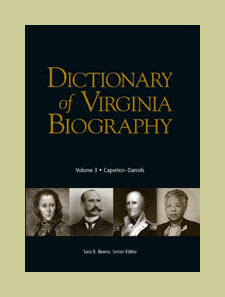 The Dictionary of Virginia Biography (DVB) is an ongoing biographical reference work covering all centuries, regions, and categories of Virginia's history and culture. Based on research in often underused primary sources, this dynamic project is rewriting Virginia history one life at a time, and many of the entries offer the first reliable biography about these subjects. The DVB highlights women, African Americans, Indians, and others whose lives have rarely been studied. By broadening the definition of who, and what, is important, these biographies have begun to reshape the narrative of Virginia's history. The first volume of the DVB, published in 1998, covers surnames from Aaroe through Blanchfield. Volume 2 (2001) covers surnames from Bland through Cannon, and volume 3 (2006) includes surnames from Caperton through Daniels. Biographies for surnames after Daniels are published online only, some in partnership with Virginia Humanities, at Encyclopedia Virginia, with digital media and primary source material. Full Description (pdf) of the project, its goals, selection criteria, and methods. Dictionary of Virginia Biography Staff, Interns & Volunteers.